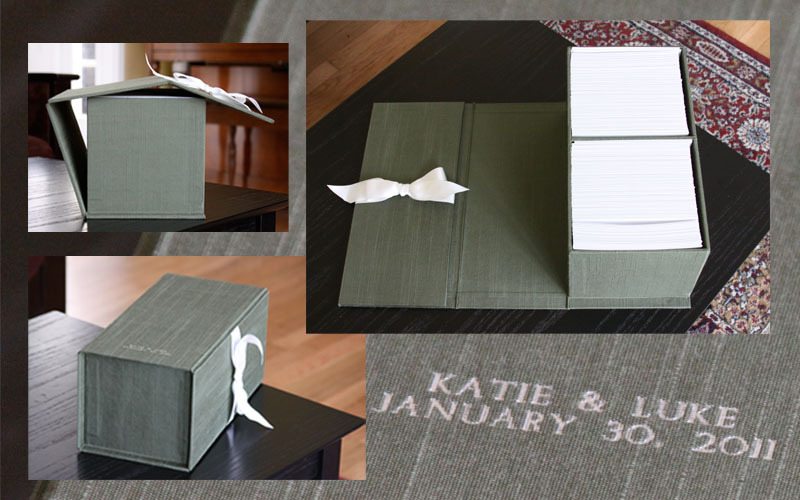 K&L's wedding packaging included this 5X5 proof box and a matching dvd folio (not pictured). February turned out to be quite the stressful month; it took nearly five weeks for Cypress to process my order (granted, they were closed one week for WPPI as well as on President's Day) and the quality of the other disc printing company I used turned out to be even worse than Discmakers. I even struggled getting the proof prints made with Bayphoto because all my digital files were so large. Bayphoto came through for me, though, as did Cypress. *Cypress's 1000-print proof box only holds about 950 prints, without wiggle room. Next time, allow an extra 50-100 print space. *Decrease image sizes before uploading. It will take a lot less time and hassle. *Expect about a four-week turnaround time. Editing the photos took about two weeks (I took around 2000 photos and narrowed it down to 950); the proofs came about two days after I ordered them, which wasn't a problem, but the Cypress order took much longer. You're so welcome! I feel like it's not enough for the amount of work that you did. The photos and their packaging are absolutely lovely. Everyone is commenting about it on Facebook. Your presence and expertise were such a gift for our special day, and I wish we could do more to reward you for that! Now, to MyPublisher! I guess the thing I'm wondering now is whether or not I'll ever do this again. I hope to. Certainly, if someone asks me, I think I know what my answer will be. I love seeing more pictures! Hooray for adding those. I love the 5x5 print size. For some reason, a square seems more professional to me. I am amazed that you want to do this again, after all that work and stress. If you do, do you think you can keep your stress levels lower? And maybe hire a helper? Nice work, Ash.